Secret of maintaining a marriage relationship is simple:Have a goodnite kiss to each other before sleep. Lifetime lovers Frank and Anita Milford have become Britain’s longest-married living couple after celebrating their 78th wedding anniversary, newspapers reported. They married on May 26, 1928 the year Alexander Fleming discovered penicillin and Harry Ramsden opened his first chip shop. The pair met as teenagers at a dance in Plymouth, southern England, in 1926 and married two years later. Shortly after they married, the couple moved to a bungalow in St Budeaux where they lived until March last year. Since retiring and moving to the Warwick Park nursing home in Plymouth, the couple have taken up a range of hobbies including gardening, snooker and darts. Asked for the secret of their enduring union, Frank Milford, 98, a retired dock worker, was quoted in Wednesday’s edition of the Daily Telegraph as saying: “We don’t always see eye to eye and we do have a small argument every day. With their relationship as strong as ever, the couple hope to beat the record for Britain’s longest-ever marriage of 80 years, set by Percy and Florence Arrowsmith. Percy Arrowsmith died last year. The pensioners, who lived in a bungalow in the St. Budeaux area of Plymouth until last year when they moved into a nursing home, have two children, Marie and Frank, five grandchildren and seven great-grandchildren. Anita Milford was in bed for 10 days recently after falling ill and her husband stayed with her the whole time, Clarke said. “They are still very much in love,” she added. Anita and Frank, have their eyes on the longest-ever British marriage set by Percy and Florence Arrowsmith, who were married 80 years until Percy died last year. 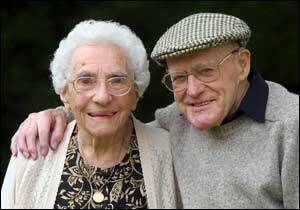 According to the Guinness Book Of World Records, the longest recorded marriages are for two couples who were wed for 86 years. Frank and Anita give Valentine’s advice: Everyday is romantic!! This entry was posted on Wednesday, February 14th, 2007 at 7:38 pm	and is filed under Interesting Stuff. You can leave a response, or trackback from your own site.